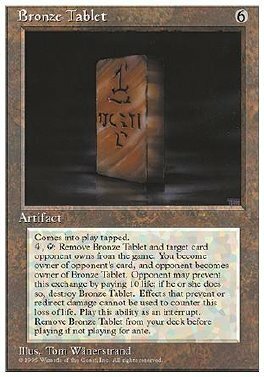 Remove Bronze Tablet from your deck before playing if you're not playing for ante. Bronze Tablet comes into play tapped. 4, T Target nontoken permanent's controller may pay 10 life. If he or she does, remove Bronze Tablet from the game. If he or she doesn't and Bronze Tablet is in play, you own that permanent and that player owns Bronze Tablet, then remove Bronze Tablet and that permanent from the game.